The Antarctic Plate is divided into two areas which are generally considered separately: an Eastern stable craton and a smaller, tectonically active region of microplates in the West, separated from the East by the Transantarctic Mountains (Dalziel, 2001). The Western assemblage of microplates consists of four major entities: the Ellsworth-Whitmore Mountains crustal block (EWM), the Antarctic Peninsula (AP), the Thurston Island block (TI) and the Marie Byrd Land block (MBL). A good portion of these microplates is submerged, and extension in the region in the past 200 Ma has resulted in embayments for first the Weddell Sea and then the Ross Sea (Dalziel, 2001). Figure from Dalziel (2001) showing locations of major microplates as well as the Weddell and Ross Embayments (WE and RE respectively). The Antarctic Plate began to rift away from the Gondwanan mainland in the early Cretaceous, associated with a mantle plume which led to the emplacement of large igneous basaltic (and granitic) provinces in the Antarctic Plate (Fitzgerald, 2002). The relationship between the Western microplates during this time relative to each other and to the Eastern Craton since then is not crystal clear, since a good deal of evidence is hidden under water and a thick ice sheet (Dalziel, 2001). As early as 1937, Alex du Toit attempted to reassemble the plates to their Gondwanan configurations based on available geological evidence. Keeping the configurations of the microplates relative to East Antarctica and to each other resulted in overlap with the Southern tip of South America, so it was proposed (and shown to be correct by paleomagnetic and geological evidence) that these plates have moved with respect to both the Eastern Craton and to each other during rifting (Dalziel, 2001). Rotation of microplates, especially of the EWM, occurred as the Weddell embayment was forming as a back-arc basin, and was finished by about 165 Ma (Fitzgerald, 2002). The other three major microplates (AP, TI, MBL) show evidence of subduction-related emplacements, and so mostly retain their current positions on the Pacific margin of the system in reconstructions (Fitzgerald, 2002). By 110 Ma, the microplates had mostly reached their present location with respect to East Antarctica; they reached their final configuration around 84 Ma when New Zealand rifted from Marie Byrd Land following the creation of the West Antarctic Rift System (Fitzgerald, 2002). Reconstruction of Gondwana by Norton and Sclater (1979) (used by Dalziel, 2001 to illustrate overlap between Antarctic Peninsula and the tip of South America). The West Antarctic Rift System (WARS) is a major feature of West Antarctica. This rift system began with Jurassic tholeiitic magmatism during the initial breakup of Gondwana (Fitzgerald 2002). However, the main phase of extension began at about 105 Ma, after the Pacific Phoenix Plate had finished subducting beneath the Antarctic Plate. This was followed by major extension until at least 95 Ma, leading to the creation of the WARS, by which Marie Byrd Land drifted farther from the Eastern mainland (Winberry, 2004). 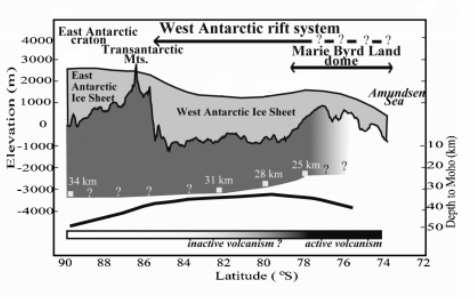 An interesting feature of the WARS is the basaltic intraplate volcanism beneath the West Antarctic Ice Sheet, as well as the upraised elevation of Marie Byrd Land. According to Winberry, this may reflect a hotspot that has been active since 30 Ma in the mid-Cenozoic. Dalziel distinguishes this hotspot from both the hotspot that resulted in the emplacement of Jurassic tholeiitic igneous provinces and the extension associated with the termination of subduction of the Pacific Phoenix Plate. Seismic wave velocity in the WARS is much slower than for the cold Eastern Craton, implying the presence of warm mantle at shallower depths (Lawrence 2006). Through seismological surveying, Winberry showed that the crust on the flanks of Mary Byrd Land is quite thin (25 km), which is consistent with the idea of extreme extension in the area, facilitating plume-related uplift and volcanism (which may or may not be currently active). Figure from Winberry (2004) showing position of the MBL dome relative to East Antarctica and the West Antarctic Ice Sheet, as well as showing crustal thinning. Dalziel, I. W. D., Lawver, L. A., 2001. The lithospheric setting of the West Antarctic ice sheet: The West Antarctic ice sheet: behavior and environment, 29-44. Fitzgerald, P. A. U. L., 2002. Tectonics and landscape evolution of the Antarctic plate since the breakup of Gondwana, with an emphasis on the West Antarctic Rift System and the Transantarctic Mountains: Royal Society of New Zealand Bulletin 35, 453-469. Lawrence, J. F., Wiens, D. A., Nyblade, A. A., Anandakrishnan, S., Shore, P. J., Voigt, D., 2006. Rayleigh wave phase velocity analysis of the Ross Sea, Transantarctic Mountains, and East Antarctica from a temporary seismograph array: Journal of geophysical research 111 (B6), B06302. Norton, I. O., Sclater, J. G., 1979. A model for the evolution of the Indian Ocean and the breakup of Gondwanaland: Journal of Geophysical Research: Solid Earth (1978–2012), 84 (B12), 6803-6830. Winberry, J. P., Anandakrishnan, S., 2004. Crustal structure of the West Antarctic rift system and Marie Byrd Land hotspot: Geology 32 (11), 977-980.